Why does the browser have to be 32-bit? How do you install the EOSCount control? How do you know the ActiveX control installed successfully? How to remove the EOSCount control that was installed from the browser. How is EOSCount different from other programs? What data is available from the camera? How do you sync your camera clock to your computer clock? Shutter count in video mode. Why ActiveX? Is is safe? Is there an EOSCount for Mac? How to use EOSCount for Mac? What is the process of obtaining a shutter count reading? What does a payment for one reading buy? Is there an option for unlimited readings? Is there an option to buy readings in bulk? What are the benefits of registering at eoscount.com? Technical requirements for eoscount.com payment process. DIGIC II and dual DIGIC III cameras are not supported. For example, shutter count is not available for the original 5D (Mark I), the 1D Mark III, and the 1Ds Mark III. EOS M (mirrorless) models are also not supported. Newer cameras are not supported yet due to changes in Canon SDK. 32-bit Internet Explorer, whether on 32-bit or 64-bit Windows. On 64-bit Windows, select 'Internet Explorer' and not 'Internet Explorer (64-bit)' when launching from the Start menu. The Internet Explorer pinned to the Taskbar on 64-bit Windows 7 is 32-bit. Firefox and Chrome are supported through the Internet Explorer tab (IE Tab). The recommended browser is Internet Explorer 9.0 or later. For Mac compatibility, see below. 32-bit and 64-bit versions of Windows XP, Windows 7, Windows 8, Windows 8.1, Windows 10 are supported. On 64-bit Windows you just need to start 32-bit 'Internet Explorer' (see above), which is usually done automatically on Windows 8+. On Windows 10, use Internet Explorer (which is included in Windows 10) instead of the Edge browser. There is a persistently reported problem on Windows Vista when Internet Explorer is not hosting the EOSCount control correctly. In particular, if you don't see the message "You have successfully installed the EOSCount ActiveX control" on the main page, then don't purchase a pre-paid reading. A browser must be 32-bit, as a 64-bit browser cannot run 32-bit ActiveX controls. The EOSCount control is 32-bit, because the Canon SDK is distributed in 32-bit form only. The download link is visible only when browsing with Internet Explorer. Note: the Windows local account name 'Administrator' has built-in limitations and may not install an ActiveX control. It is recommended to use a Windows user name different from 'Administrator'. Above the control you should see this message: "You have successfully installed the EOSCount ActiveX control. Now connect your camera and power it on." 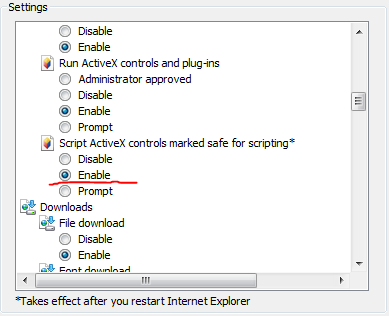 If you installed the ActiveX control from the browser prompt (as opposed to a manual installation of the .msi), you can use the following script to properly remove it: remove_eoscount_activex.wsf. The script will detect whether the control is installed and will prompt you to remove it. Note that you need to run this script when the browser has not loaded the control. This means either going directly to the FAQ page (not from the home page where the control was running), or saving the script, closing the browser, and opening the script in Windows Explorer. Running this script is recommended if you get a prompt when you already have the EOSCount ActiveX control installed. Go to "%WinDir%\Downloaded Program Files" (such as "C:\WINDOWS\Downloaded Program Files"), right-click on "EOSCount Control 2.0", and select Remove. 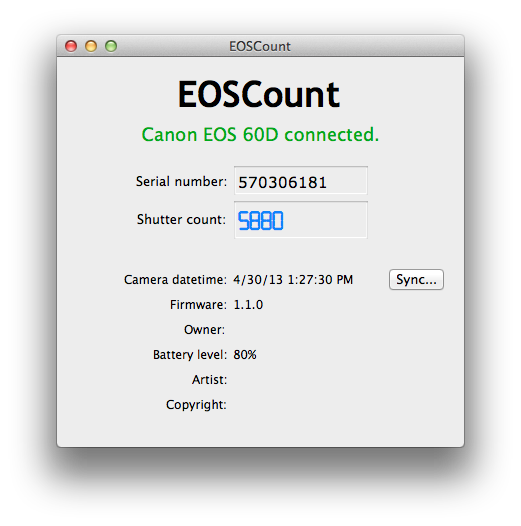 EOSCount is the only program to use Canon's way of determining a shutter count for recent EOS cameras. Other programs represent hacks or "best guesses" as to how a shutter count can be retrieved. EOSCount offloads the shutter counter determination to Canon's official Software Development Kit, and so is the most trustworthy. 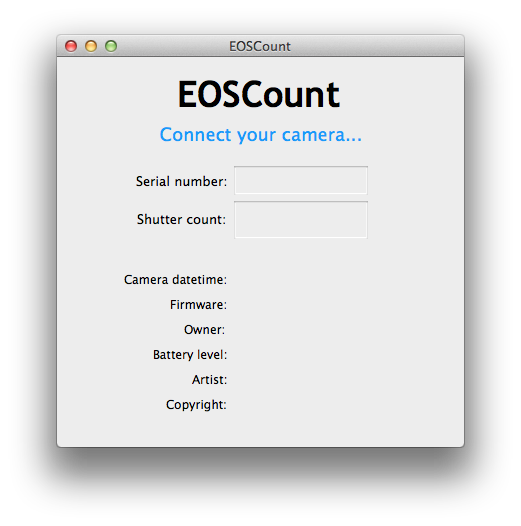 Shutter count obtained through EOSCount represents the number of physical shutter actuations from the camera manufacture date or shutter replacement date. This number is not affected by usage of multiple memory cards, firmware upgrades, camera resets, etc. Serial number (not available with some cameras). Digic V cameras have a firmware bug that prevents proper display of the serial number. Canon EOS 5D Mark III firmware v1.2.1 restores proper serial number for that model. Battery level (fully charged battery will show 80%). Having connected your camera to your PC, click on the Sync... button next to the camera datetime in the EOSCount control. The dialog box that appears will show a clock reading for the camera and clock reading for the PC to which the camera is connected. You can easily check the difference in clocks. Click on the Ok button to synchronize your camera clock with the computer clock. Shutter counter is not incremented by a camera in video mode. This means that video clips will increment the filename suffix, but not the displayed shutter count. It is necessary to power cycle the connected camera (turn off and on) in order to see the updated shutter count value. This is due to a technical optimization that minimizes battery power drain when a camera is connected to the EOSCount control. A new flash card is inserted containing a picture file with higher numerical suffix. The numbering then continues with this higher suffix. For example, if the last file written by the camera was IMG_3750.JPG, this indicates that the shutter count is 3750. If a new flash card is inserted with a file IMG_4100.JPG, then the next picture taken with the camera will be written under IMG_4101.JPG. The shutter count in this case will be only 3751. If a blank flash card is inserted afterwards, some cameras like the Canon 60D will continue previous filename numbering; for example, will write file IMG_4102.JPG when shutter count is 3752. The file name is edited to lower the numerical suffix. Some cameras, such as the Canon 5D Mark II, will use the card filename to construct the name for the next picture. This results in a much lower perceived shutter count than the true shutter count. For example, let's say the filename is edited from IMG_9000.JPG to IMG_2000.JPG. The next picture file written by a camera like Canon 5D Mark II will be IMG_2001.JPG. The perceived shutter count is 2001, whereas the real shutter count is 9001. A standalone program. EOSInfo fits in this category. A standalone program has the same access rights as the user who launched it, except no immediate admin rights on Vista/Windows 7 (thanks to User Account Control), even if started by an administrator. A COM object that is run by a browser process (an ActiveX control). An ActiveX control runs at the same priviledge level as the user who launched the browser, but in addition IE 7.0 and later on Vista/Windows 7 run with greatly restricted privileges (even compared to a standard user). This is called IE Protected Mode and is enabled by default for the Internet Zone. In the Protected Mode, code running in a browser can write only in a few pre-defined directories under the user profile directory and has similar restrictions for registry access. See Understanding and Working in Protected Mode Internet Explorer for more information. A browser running in Protected Mode is more secure than a standalone program. EOSCount code does not access local filesystem or registry. The only system resource it uses (indirectly, through EDSDK) is a USB port. Therefore, choosing the least priviledged option (option #2, or packaging in an ActiveX control) is the best option. If you're concerned about security of your computer, you're encouraged to verify the EOSCount control with a software security provider of your choice (Symantec, ESET, Kaspersky, etc.). You may also find it useful to learn how User Account Control feature in Windows Vista/Window 7 prevents random code from making system-level changes. EOSCount for Macintosh client application is available. The minimum required Mac OS X version is 10.7 (Lion). Download the disk image file and open the Downloads folder. Click on EOSCount.dmg to automatically mount the disk image. Click on EOSCount icon to launch the EOSCount for Mac application. Dragging the icon to the Applications folder installs the EOSCount app for future use. Having dragged EOSCount icon to the Applications folder, you can unmount EOSCount.dmg archive. Find EOSCount device in any Finder window (under DEVICES section on the left) and click the eject button. To uninstall, move EOSCount application from the Applications folder to Trash. An internet connection is required for successful usage of EOSCount for Mac. Having installed the EOSCount control and connected a compatible camera, you will see “Shutter count is available!” green heading to the right of the control (the control itself will not display the shutter count value). This means that the shutter count has been recorded and will be available after a small fee. Under the green heading there will be a link to PayPal, which you can click to pay the fee. After paying on PayPal, click the “Return to EOSCount” button to see the paid shutter count on eoscount.com. Your camera must still be connected, powered on, and have unchanged shutter count in order to see the paid count. A payment is good for one unique shutter count reading. A unique reading is a unique combination of camera and shutter count value. Once a unique reading has been paid, it can be read again and again by connecting the same camera, provided the camera has not had additional shutter actuations since the paid reading. If images were taken and the shutter has been actuated, there is a new unique shutter count value that will require a new fee. For frequent users, there is an option to buy unlimited readings from a camera with a one-time fee (approximately equal to the cost of three regular readings). This option is per camera, e.g. it buys unlimited shutter count checks only for the camera (model and serial number) which it was purchased for. Another camera can be tested unlimited times for another such fee, etc. The option to purchase unlimited readings is presented below the option to purchase the current reading, after a compatible camera is connected. There is a discounted option to buy 200-reading packs. It is available on My Account page after log in. A PayPal account is not required. PayPal can process a credit card payment without a PayPal account. EOSCount.com does not receive any credit card details from PayPal - all card data is processed securely by PayPal. By opening an account on eoscount.com you will be able to save paid shutter count readings for future reference. They will be available after the camera has a new unique shutter count value. Saved readings are listed on My Cameras page that is visible after Login. Certain cameras (currently DIGIC V cameras with old firmware) require registration because they do not send a unique serial number to the EOSCount control. In this case, since the camera cannot be uniquely identified, it needs to be connected with a unique user account. Another benefit of registration is the ability to buy pre-paid reading credits for future use. Several credits can be bought with a single PayPal transaction, stored in your account, and used to unlock unique shutter count values without going to PayPal for every reading. These settings are enabled by default for the Internet Zone. No adjustment is necessary if the default Internet Options are used.